Well, after 16 months of inquiries to Brian Wilson's publicist, I finally got my dream interview - talking to Brian Wilson about SMiLE! I had my questions lined up for some time now, always adding and deleting questions depending on what I'd read in his recent interviews. I definitely DIDN'T want to ask the same questions that he had been asked time and time again since February of 2004 when SMiLE became a reality! I felt like a hyper little kid on a "candy-jolt" asking my questions, but I wanted to ask as many questions as I could in my 15-minute allotment. About midway during the interview the phone suddenly went dead, and I was in a panic! Luckily, I got a call right back and we continued the interview. Brian's energy and enthusiasm about SMiLE was very obvious in the interview! Especially when compared to my 2000 interview with Brian in which he answered many of my questions with just a 'yes' or 'no'. For this interview, there were even a couple of instances when he interrupted the question because he seemed so excited about telling me the answer. Of course there were some questions that I wished I had time to ask (especially more SMiLE questions) and there are a few that I should have gotten Brian to try and clarify. But I wanted to ask as many of my questions as possible in the time period. It was the interview of a lifetime - I never would have imagined that I would get to talk about SMiLE with Brian Wilson. My 16-month persistence really paid off! E.C. : I know you've been doing a lot of interviews so I'm going to try ask some questions that you haven't been asked a million times before regarding SMiLE. E.C. : When I was watching the BEAUTIFUL DREAMER documentary, I noticed a couple of George Gershwin "Rhapsody In Blue" connections. E.C. : It was really cool when you played part of "Rhapsody In Blue" on the piano, you then went right into "Heroes & Villains". Brian Wilson: Right, how'd you know that? E.C. : I recently picked up a copy of "Rhapsody In Blue" and noticed a couple of similarities, such as recurring melodies and repeating themes. Did "Rhapsody In Blue" influence SMiLE? Brian Wilson: A little bit, not much. It influenced "Heroes & Villains" and a couple of others. E.C. : But you were you trying to "Americanize" pop music in the way that Gershwin Americanized jazz and classical? Brian Wilson: Yeah, we were trying to "Americanize" early America and mid-America. Brian Wilson: We thought of it as 2-movement rock opera. Then we added a third then we called it a 3-movement rock opera. E.C. : Also in the film there was a scene that Darian [Sahanaja] talked about when you played a missing fragment from "Roll Plymouth Rock". E.C. : I know some songwriters can keep melodies and ideas in their head for years - were there any other gaps from the original concept of SMiLE that came back to you? Brian Wilson: Not really, we took most of it from scratch. Brian Wilson: Yes, it does. E.C. : How close is SMiLE 2004 to what you wanted SMiLE 1967 to be? Brian Wilson: Much different, much different. Much more progressive, much happier, much more uplifting. E.C. : Did you ever have the intention of using Haven Gillespie's "Old Master Painter" lyrics? Brian Wilson: No. We lost them, we couldn't find them. We were going to do it vocally, but we couldn't find it. Brian Wilson: That was because of Darian Sahanaja and me. We sequenced it together with computers and Pro-Tools, modern instruments. And it took us about two weeks to do that but we got it all sequenced together. E.C. : So was that something that you came up with exclusively for the 2004 SMiLE or did you originally intend to use link tracks on the original SMiLE? Brian Wilson: No, that's 2004. E.C. : The reactions to the SMiLE live shows and CD have been phenomenal. I've talked to people at the shows and they tell me how they've seen grown men reduced to tears. There must be a certain satisfaction that the world was finally ready for SMiLE and accepted it. When did Smile become "appropriate"? Brian Wilson: About 9 months ago I did. Nine months ago my wife, my manager and publicist told me that the world was finally ready for SMiLE. So I agree…so we immediately learned it with my band and my orchestra. We premiered it in London, England in February and it went over fantastic! Which made us want to record it. E.C. : Yes - when you originally talked about your "master plan" for SMiLE, that was just the live performance correct? E.C. : And THEN the response made you want to do a CD? Brian Wilson: Because we wanted something a little more appropriate, you know? Something that sounded more appropriate. E.C. : Talking about the title for SMiLE, I know it was originally called "Dumb Angel". What made you decide to change the title from Dumb Angel to SMiLE? Was that Van Dyke Parks idea? Brian Wilson: Yes it was. E.C. : After all the years after SMiLE was abandoned in 1967, did you ever - until the current version of SMiLE - did you ever think about going back to it and working on SMILE again? E.C. : Too many bad memories? Brian Wilson: And too many drugs we were taking. E.C. : There were a couple of original SMiLE songs, such as "He Gives Speeches" - why were these left out of SMiLE 2004? Brian Wilson: They didn't fit the album. E.C. : What was the best part of being able to revisit this music in 2004? 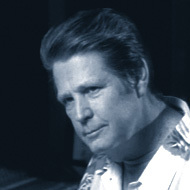 Brian Wilson: The greatest part of it was of course the music itself. The way we constructed it, the way we first conceived of it - a move of Americana - that's what it was. E.C. : How did you get through your self-doubts in order to complete it? Brian Wilson: I got over it right away when we started working on it. E.C. : Any chance of an updated Brian Wilson autobiography? Especially now that you've completed SMiLE? Brian Wilson: My what? My autobiography? What do you mean? E.C. : The Brian Wilson book that came out several years ago. Is there any chance that you might revise it? A new version? Brian Wilson: We just might do that, yeah. E.C. : When you listened to RUBBER SOUL by the Beatles, was it the American version of the album or the British version? Brian Wilson: I know, I heard about that, yeah. E.C. : Have you ever considered releasing a CD of demos, or just you singing at the piano? Brian Wilson: No, I have not done that. Somebody suggested to me…David Leaf suggested that I try that and I said, 'no, I don't wanna do that'. E.C. : I also heard that you were planning on doing an album with Paul McCartney? Brian Wilson: We might do a rock 'n roll album with a nice beat to it. E.C. : Because the last time I interviewed you in 2000, I'd asked you about working with Paul and you said you didn't think so. E.C. : Do you practice transcendental meditation anymore? Brian Wilson: I used to, but I can't really relax any more to do it. I can't get myself relaxed enough to do it. E.C. : I know you are planning an album with Paul McCartney, but are there any plans on doing more recordings with Van Dyke Parks? Brian Wilson: I doubt it…if we'll do any more recording. Probably more songwriting. I'm going to do the recording myself. E.C. : Because I loved ORANGE CRATE ART. Brian Wilson: Yeah, that was quite, quite the cool album. E.C. : Dennis Wilson often sang "You're So Beautiful" in concert. Was he one of the uncredited writers of that song? Brian Wilson: He did not write that song. E.C. : Does you still believe in making spiritual music? Brian Wilson: I do yeah, to some extent I do. I think it's important to do that. E.C. : Was SMiLE originally influenced by any certain religion? Brian Wilson: NO, NO, NO, NO. That was totally original. E.C. : So there were no Zen influences? Brian Wilson: No. It wasn't inspired by Phil Spector either. Brian Wilson: Well Ronnie, thanks a lot for calling and we'll talk to you later. E.C. : I'm looking forward to the show tonight! Brian Wilson: I'll see you backstage.